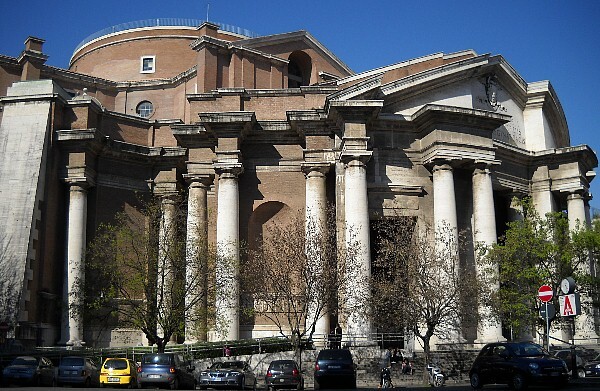 Armando Brazini's [sic] neo-Baroque church of the Cuore Immaculata di Maria Santissima in Rome has quasi-circular plan containing a Greek cross plan. 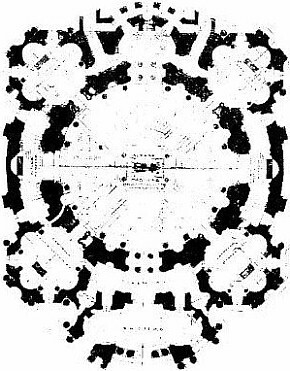 The Greek cross plan is reflected on the outside in four pedimented porches marking the ends of the cross. These porches, in turn, are made convex to accomodate to the circular plan. Robert Venturi, Complexity and Contradiction in Architecture (New York, MoMA, 1966), p. 78. What you see is a harmonius and dissonant architectural symphony of complexly layered elements--formal and symbolic, masterfully defined by shade and shadow, combining rhetoric and substance, Baroque fanfare in Palladian drag, and whose juxtapositions--or rather, collisions--of curves, rectangles, diagonals--as squat columns, gross piers, useless buttresses, eloquent walls and voids, domeless drum, protruding and receding segmented pediment--must in the end compose in the Fascist era a glorious final gesture of what can be considered Baroque survival. Robert Venturi, Iconography and Electronics upon a Generic Architecture (Cambridge, MA: The MIT Press, 1996), p. 60. 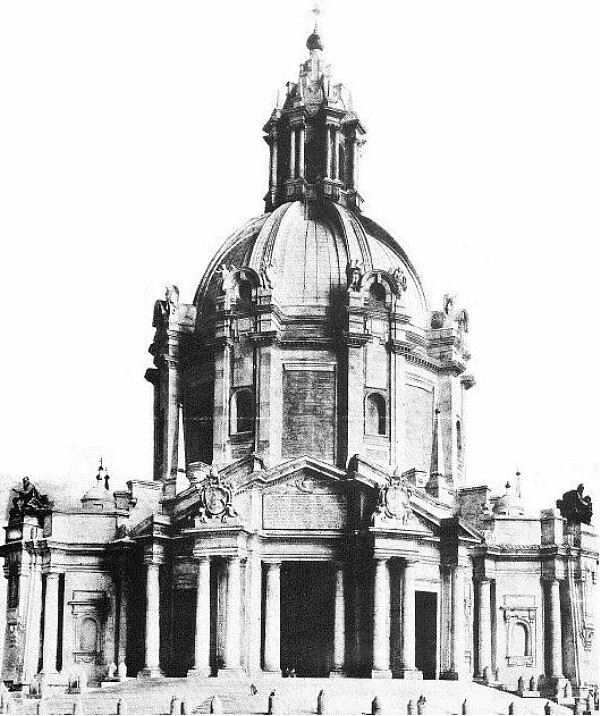 Thank God--or Maria Santissima--the church, as I've said, was never finished: The dome is missing and this circumstance diminishes the historical literalism of the architecture and establishes the building, in my opinion, as a grand and fortuitous fragment--as an unfinished symphony. And it makes the rhetoric of the now functionless buttresses more poignant and eloquent in their effect. Robert Venturi, Iconography and Electronics upon a Generic Architecture (Cambridge, MA: The MIT Press, 1996), p. 61.